Riders of folding bicycles are taking on a city biking challenge today as part of a weekend of cycling in London. LLFGSS team in Scala Street taking part in the Brompton Urban Challenge. 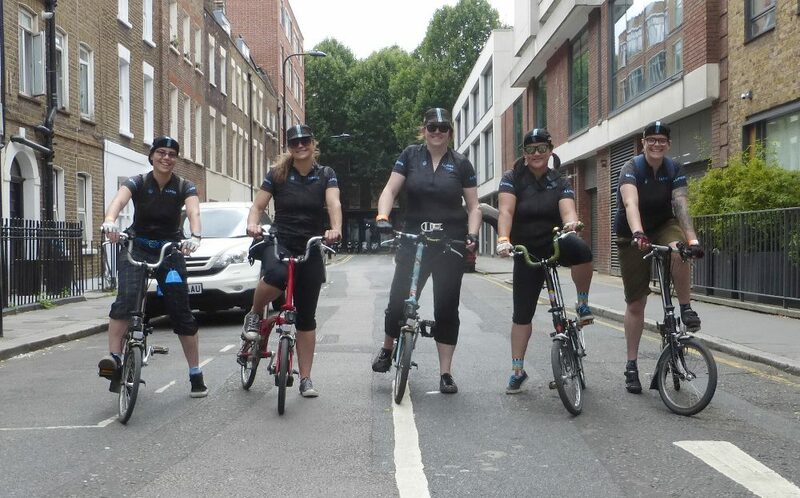 We spotted an all-women team — the London Ladies Fixed Gear and Single Speed (LLFGSS) riders — in Scala Street in Fitzrovia who kindly stopped to allow us to take a picture. The Brompton Urban Challenge is an event that tests teamwork, orienteering skills and creativity. Riders take on a choice of cycling challenges and submit a photo of what they’ve achieved.